Yesterday I posted one of my shots from early Sunday morning, today in this post I will be sharing the other two. As I mentioned I was driving home from a wedding reception in Alpena, on M-32 almost to 131. I looked to the north, where as luck would have it there was a vacant field. In the clearing I noticed a faint green glow, a recognizable faint green glow. I pulled the van over, rather quickly, it seemed to jar Kayla from her sleep. I pulled out the tripod and the camera and set up on the side of the road. At first I did not foresee the glowing tail lights to be a problem, but in the first exposure they proved to be. I was hoping they would not reach that far up in the frame. I replaced them with a strobing light pointed down at the roadway, as a traffic safety precaution. 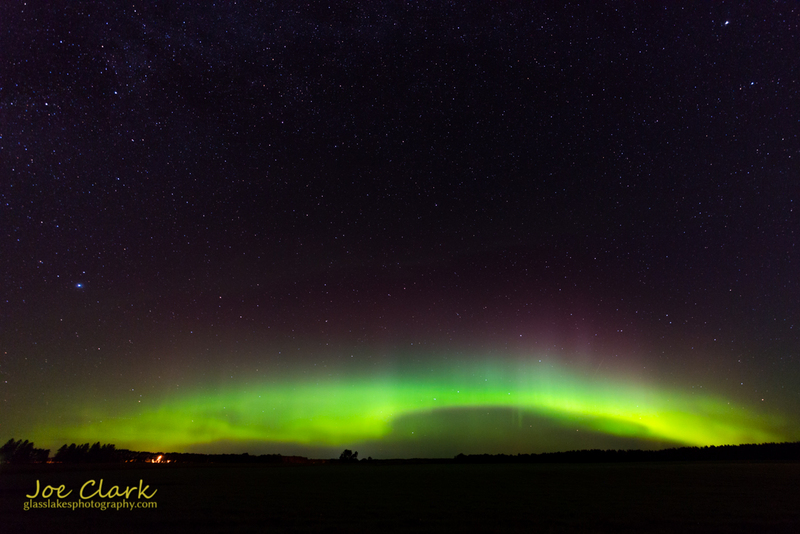 The lights put on a fascinating bright show as they rotated across the sky to the east. Lacking interesting foreground I decided to pack it in and migrate to the northwest to Walloon Village, a town where Hemingway’s parents had a lake cabin, and he spent a significant portion of his childhood. We set off towards Walloon, sometimes questioning if the lights had faded. Making it to the town I located a grassy area near the dam on the south end of the little public beach. I set up with one leg on the concrete form which was part of the spillway. 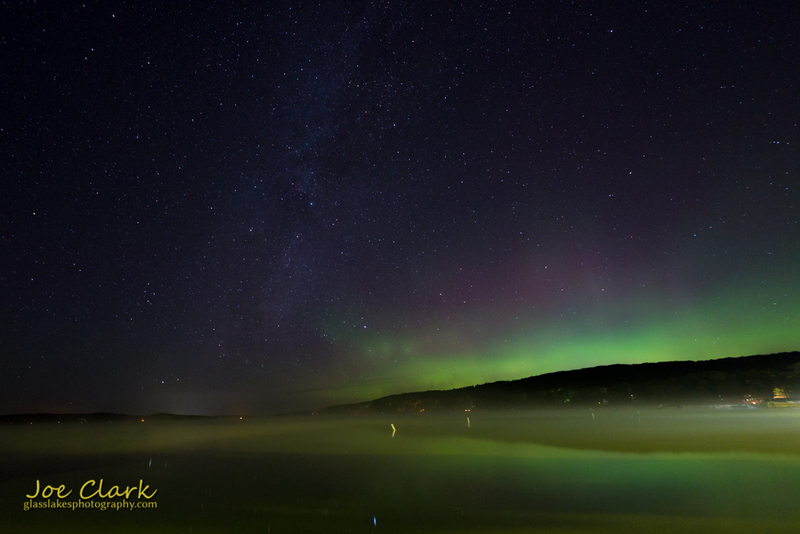 I shot my first exposures to the west, where I have been told pink was glowing in the aurora. The cold temperature of the lake was creating a fog which hung low to the water. The northern lights and the stars seemed to have no problem reflecting off the water through it. There is a minimal amount of light pollution coming from the nearby village, the most annoying being the sodium lights throwing a yellow color temperature into the frame. I can only imagine what kind of impact these sights would have had on the young Hemingway, as he camped out near the lake and in the woods surrounding Walloon Lake. After these shots on Walloon Lake we packed up and headed home arriving around 5am, concluding our long drive across the mitten. These images are for sale, and will be uploaded to the galleries soon. For use permission, contact photographer Joe Clark with the contact us option in the menu.